Get hyped for Babefest with some new recordings! The farmers' market may have closed too early for rock n’ roll hours, but Ani and company were still in fine form for this one. 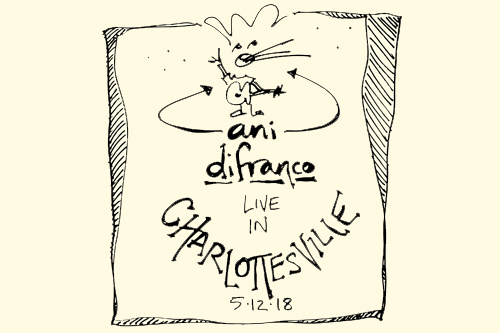 Charlottesville 5.12.18 is Ani’s first bootleg since the release of her 2017 studio album Binary, and features the title track as well as “Alrighty,” “Play God,” and “Deferred Gratification.” The set also includes the first available bootleg performances of “Still My Heart,” and “If He Tries,” along with live favorites such as “Shameless,” “Gravel,” and “Joyful Girl.” Gracie and Rachel, who opened the show, join the band on several songs. Available in high-resolution audio.